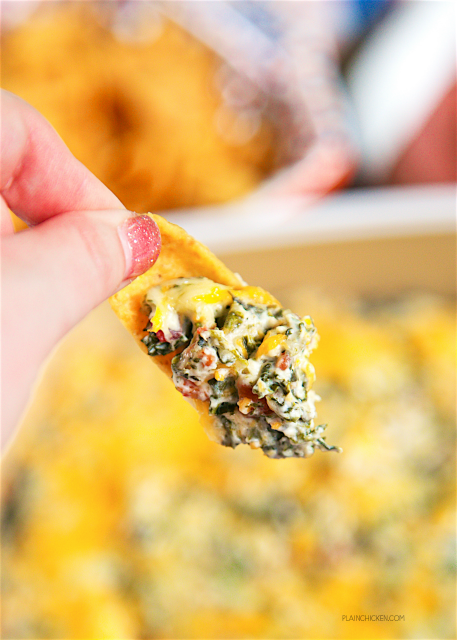 Cracked Out Spinach Dip - the BEST spinach dip EVER! Spinach, cheddar, bacon, Ranch, cream cheese and sour cream. This stuff is so addictive! Great for parties and tailgating! Everyone asks for the recipe!! Happy Football!!!! College football is finally here. It is like Christmas at our house! I can't wait to watch all the games and eat all the yummy tailgate food! We are having a HUGE tailgate for our game tomorrow. Our whole group will be there, and we will be feasting on tons of great food. I am making this Cracked Out Spinach Dip. It is SOOO good! I am not a huge fan of spinach dip, but I scraped the bowl to get every last bit of this dip. CRAZY good!! PLUS it's healthy because it has spinach - right?? No? Dang it! 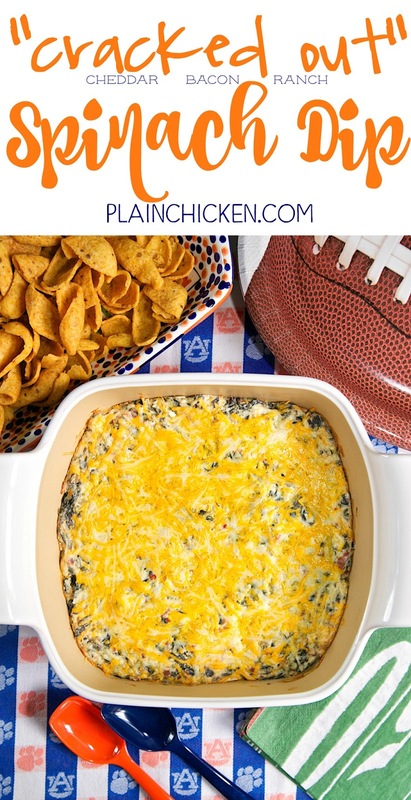 You can make this dip ahead of time and refrigerate it until you are ready to bake it for your football party. It tastes great hot or at room temperature. We served this dip with some Fritos, but you could also use tortilla chips or some celery. It will be fabulous either way! **To transport the hot dip to the parking lot, I use this Pyrex Portable 4-Piece Set . It works great! Preheat oven to 350ºF. Lightly spray a 9-inch pan with cooking spray. Set aside. 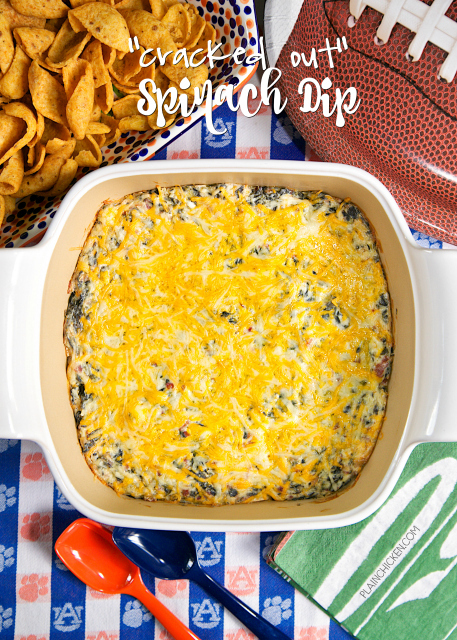 Mix together spinach, cream cheese, sour cream, bacon, Ranch mix and 1 cup of shredded cheese. Spread into prepared pan. Top with remaining 1/2 cup cheese. Bake for 25 to 30 minutes, until bubbly. Serve with Fritos and tortilla chips. Which ranch dressing do you use? The buttermilk included or without? I used Hidden Valley Ranch dry mix. Don't make the dressing. Only use the seasoning packet. I am planning on making this for a party. How many people does this serve? Just wondering if i should double or triple the recipe.